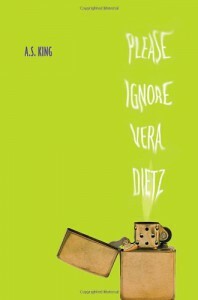 By the time I read through Please Ignore Vera Dietz I had to question: why the hype? Why is this book popular and, by the large, so well received? If I am going to speak honestly, I have to say that I would rather not recap this book at all. The only emotion King roused in me was the strongest, most long-lasting heat-wave of anger I’ve experienced by reading a book, and it was all directed at Charlie. To top it lightly, Charlie betrayed and bullied his best friend–from feeding the entire school a Dietz family secret to chucking beer cans in her direction, and not to mention tossing a pile of some literal nasty onto her head. Charlie was cruel at every chance he got, sullied everything that was sacred in their friendship, and offered no apologies. I won’t deny it: if I were Vera, I’d cry. That is some cruel punishment from your childhood BFF. The book begins at Charlie’s funeral, however — he died before they two could mend their shattered friendship. Throughout, “a word from the dead kid” appears as Charlie talks about his decisions, and of Vera, but he cannot explain his betrayal. Paraphrased, and if memory serves me right, his reasoning stands: “So why did I betray Vera? I don’t know.” Wow, how enlightening. Charlie loved Vera but shunned her away out of fear, believing she is levels above him in a world of class. I can respect Vera’s character: she loses her best friend twice–a lost friendship that can never be restored, and despite the many ways in which Charlie trampled over her, she holds her head up. But can she find it in her to forgive Charlie? (Because I cannot and will not.) Aside from her secret fancy of alcohol binging, Vera displays humbling traits in spite of all that has occurred. And yet: just as I don’t have it in me to forgive Charlie’s actions, I feel nothing toward Vera. Nothing. Not even the slightest drop of sympathy. Charlie treated her cruelly, and although she suffers for it, I feel that Ms. Dietz is underdeveloped. I fully acknowledged Vera’s presence in the book, but I didn’t connect and continued reading as if she were a nagging part of the background. To some extent, it was an odd reading experience. Even more so, it was simply frustrating.